According to the National AIDS Trust, in 2015 nearly 90,000 in the UK received HIV specialist care. That’s quite a figure. HIV is no respecter of gender, age, sexual orientation or religion and between 2006 and 2015, there has been a 73% increase in the number of people accessing HIV care. It’s a difficult subject to talk about, and one probably avoided at most dinner parties. But Patrick Cash’s new play The HIV Monologues which I saw at the Ace Hotel, Shoreditch, is a wonderful way to get the conversation started. ‘Resting’ actor Alex (Denholm Spurr) has a lot going on at the moment. Not only is he about to go on a first date with Tinder match Nick (Kane Surry) but tomorrow, he is going to a hospital to audition for a role in a play by writer Barney (Jonathan Blake). Alex and Nick’s date is going well – after Nick’s horrendous opening flirting and dreaming up a new cocktail – which by the sounds of it could have been improved by a hint of turmeric. The two lads have lots of shared interests and everything in the garden is rosy until Nick informs Alex that he is HIV positive. To say Alex freaks out would be an understatement. However, this is not the least of his problems as, when he attends the audition, he finds out that not only is Barney’s play about someone with HIV but Barney himself is HIV positive and his treatment is being supervised by the fiery Nurse Irene (Charly Flyte) who has been looking after HIV/AIDS patients for many years now. Four people, mostly strangers to each other, but now linked by the spectre of HIV and each with their own story to tell. Patrick Cash is an amazing author. His five-star rated play The Chemsex Monologues is a fantastic piece of work and now, with The HIV Monologues he has raised the bar once more for this type of theatre. Before moving on, my one criticism here is the title. When I told people I was going to see The HIV Monologues, the major reaction was negative with people saying things like “that sounds like it will be a lot of fun……..not” and I do wonder if the title is slightly off-putting to some potential viewers. If it is, then this is a real shame as this amazing play should be seen by everyone. It tackles a difficult and deadly subject with a humour and wit that is very surprising. The awkward first date – and we’ve all been there, right? The initial reaction and sheer ignorance of HIV that still prevails amongst the population – for example. Alex being scared he might catch HIV from kissing. The parental reaction, where a father is happier to lie to his workmates about his son’s, his bloodline’s condition rather than admit the truth. All of these topics are covered and more. Having read the play text again this morning and receiving some odd looks as I sobbed quietly in places, I think my favourite of the monologues is Irene’s. She stands out for me in two wonderful ways. First the episode with the cupcake which is so sweet, gentle and natural and second when she confronts the gentlemen of the press back in the 1980s as they covered the ‘gay plague’ in their traditional, horrific way that set attitudes at the time and unfortunately has let some of them fester on through to today. Of course, The HIV Monologues is more than a fantastic script and relies on four highly talented actors. Denholm Spurr makes Alex, potentially someone you could really dislike, very real and believable. His reaction to Nick’s revelation is both shocking and funny, and his subsequent use of the event to convince Barney to cast him is both shocking and brilliant. Nick is a difficult character to get right since few of us know how we would react on being given the news that we were HIV positive. But Kane Surry’s Nick feels just right in his reaction. In the final monologue when Nick and Alex are on stage together there is a real chemistry between the actors that suggest the characters may be OK in the future. Charly Flyte’s Nurse Irene is just wonderful and if I ever find myself in hospital I want her to look after me. When she turns to face the reptiles of the press, Charly doesn’t hold back and you could imagine them cowering beneath her gaze as she lets them have it and then, as she talks to her mother, there is a real tenderness and vulnerability about her that makes you just want to give her a hug and maybe a mojito or two. Finally, Jonathan Blake. If you haven’t heard of this actor, then go and rent the movie Pride as soon as you can for his real life story is covered in it. Jonathan was one of the first people to be diagnosed with HIV in the UK and is still here to tell the tale. When he speaks of seeing people die or using honey to sweeten the cocktail of drugs you know this is not an actor reading from a script, this is a man that has done these things and who speaks with the voice of sincerity. All told a truly inspiring cast. Luke Davies keeps the direction light and allows the characters to move naturally around the small stage which Liam Mercer’s lighting makes appear larger than it is. All in all The HIV Monologues is just an amazing play. One of my favourite parts of the play was when Louis was talking to Nick and telling him that, as he would be living with it for the rest of his life, he had to name his HIV. We never found out what Nick called it but it started me thinking about, should it ever happen, what I would call it, and I came up with an answer. It’s an Australian word – not that complimentary – but if I was ever diagnosed as positive, then I would give it the name Bogan. And this is the real strength of this fantastically well written, produced and acted piece. It makes the audience think. When I returned home, I was talking with my housemates about it and we got into a discussion about when would be the time to tell a potential new partner that you were positive. First date, like Nick, second, or the infamous third date where tradition says things get more physical? Funnily enough, we didn’t come to a consensus but the conversation was there and led on to other conversations about HIV and its effects, and that has to be a good thing. 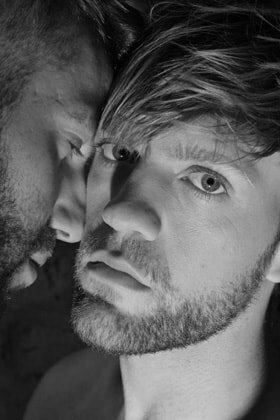 After a critically acclaimed launch at the end of 2016, Dragonflies Theatre’s new production returns in 2017, exploring HIV amongst gay men through a series of interwoven stories. Writer Patrick Cash and director Luke Davies continue their work, including show The Clinic and The Chemsex Monologues, in bringing important queer stories to the UK stage with The HIV Monologues, which stars inspiration for the film Pride and one of the first people to diagnosed with HIV in the UK Jonathan Blake. Alex knows nothing about HIV but knew he should have worn the power bottom singlet. Nick is his Tinder date who’s just been diagnosed positive, struggling with self-worth. Their date is going amazingly until Nick discloses his diagnosis… And Alex reacts in the worst way. Through meeting Irene, an Irish nurse who treated AIDS in the 1980s, and Barney, who was saved by the 1996 medication, Alex gets on PrEP, but will he be able to win Nick back?